The Nissan Aussie sold in Japan. This year marks the 20th anniversary of Australia’s disastrous foray into exporting cars to Japan. 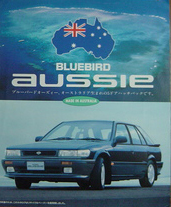 For a brief period from 1989 to 1992, fully imported Bluebird Aussie cars made in Australia went on sale in Japan. The Bluebird Aussie was apparently the result of Nissan Australia’s Matilda Project, which had aimed to make a solely Australian car for Australian conditions, but ended up being a modified bluebird. Aussie flag clock, kangaroo stuffed toy, sheepskin seat covers…premium added extras. Australia was, at the time, at the peak of its powers in the enormously fickle Japanese market. Thousands of Japanese tourists were flocking Down Under and Australia was on the verge of overtaking Hawaii (albeit very briefly as it turned out) as the most preferred destination for Japanese honeymooners. Perhaps it was a desire to capitalize on this goodwill toward the land Down Under that prompted Nissan to import cars from Australia, hardly a country with a reputation for automaking. Nonetheless, with all the very best of “That’ll have to do, mate” quality and offering added extras such as sheepskin seat covers, a free kangaroo stuffed toy, an Aussie flag keyring and Aussie flag sticker under the dashboard clock to entice Japanese punters, the Bluebird Oozui, as the car was labeled for the Japanese market, hit showrooms across the country. 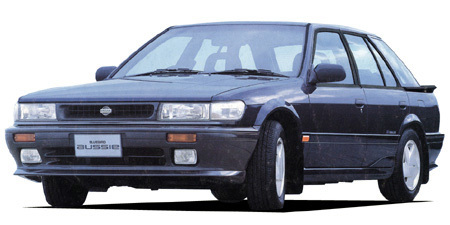 The Bluebird Aussie was an embarrassing failure in Japan…In fact, of the 44,049,099 new and used car sales in Japan from 1989 to 1992 — the period the Aussie was on sale — the Australian-made hatchback accounted for a mere 1,300 units. Nissan Australia shut down its manufacturing plant in 1993 and the Aussie was never heard of again…not that many Japanese consumers ever seemed to have heard of it in the first place.